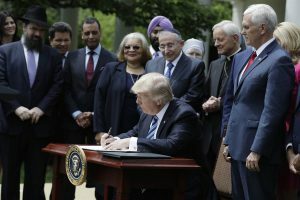 On Thursday, President Donald Trump signed another executive order, with this one making it easier for the participation in politics by churches. The order seeks to deliver on one of the pledges he made during his campaign to a group that overwhelmingly gave him support in last November’s election. The executive order, which was unveiled by Trump with much fanfare in a ceremony held in the Rose Garden, was cheered on by a number of conservative Christians but looked at as disappointing to others, who believe it came up short of broader changes they had wanted in what was a highly anticipated measure for religious liberties. Trump said the order removes financial threats faced by churches that are tax-exempt from the IRS when pastors support their political candidates. However some legal experts say it is nothing more than a symbolic gesture that will not likely change how the issue is policed by the agency. The order by Trump celebrated on National Day of Prayer with religious leaders, directs the White House to consider the development of regulations that are related to a mandate set up by the Obama administration, that were objected to that required contraception services be included in health plans. The order’s range was much narrower that a draft that has been leaked in February, that had alarmed gay right supporters and libertarians as well as other advocacy groups that are liberal. The president added that he would be directing the Department of Justice to develop new rules that would guide the process. One senior counsel at a faith group criticized the new order saying it was vague and questioned if the IRS would carry through the directive of Trump. Even the latest version that is scaled back, prompted the treat of lawsuits, but some groups commented that after the order was reviewed they would hold back on legal action, arguing it would not have much impact. The Executive Director of the American Civil Liberties Union, Anthony Romero through a prepared statement said the executive order was a photo-op without any discernible policy outcome. He added that after a careful review of the text in the order, the ACLU determined the order did not alter in a meaningful way the ability of individual or religious institutions to intervene in today’s political process.